Today, I’m going to work, then I’ll teach a great lesson. The kids will listen and learn. I’ll finish my day pleased that it was a good day, then I’ll go home. I know there are a lot of details missing, but for the most part, it’s how we write our story each day. I didn’t ask for a co-author. What happens, however, is that as much as we want to be the sole author of our story, there are people who come into our lives every day that, without our permission, start writing in our story. For example, in the middle of your great lesson, Johnny decides to be disrespectful by making a loud yawning sound in the back of the class, getting everybody’s attention. That was not part of your story. He just penned a paragraph in your story that may change the happy ending that you had written. Johnny just changed your story. How frustrating is that? Now, you’ll have to try and make adjustments to hopefully not allow what Johnny wrote keep you from ending your story the way you had planned. You’ll write a follow up paragraph to your story about how you gave Johnny a warning, and he apologized for his disrespectful action. You hope that now your story will continue without any more modifications. Johnny keeps on writing my story. That’s when it happens. Johnny starts making faces at his friend across the room. You see him, and you can’t believe it. He’s back to writing in your story, and you now have to write another paragraph that you had not anticipated writing about how you stopped the lesson to give Johnny a consequence, which causes him to get even more disrespectful, leading to you eventually having to send him out of class. This was not part of the story that you had written for yourself when you started the day. Johnny has become a co-author in your story without your permission. Now your happy ending won’t be as happy as you had planned. What’s up with that? Our days are filled with story re-writes. The truth is that our days are filled with story re-writes, and we don’t even notice it. Most of the time, the changes in our story are changes that we do not want. We don’t want to have to take the detour on the way to work, because someone wasn’t paying attention and rear-ended another car causing a traffic jam. We don’t want to have to interrupt our class during the best part of our lesson, because the assistant principal chose to conduct a surprise fire-drill. We don’t want to have to call Johnny’s mother to tell her that her son was bad today. These events were not part of our story, but because of the decisions of others, our story was changed, and not for the better. It’s no wonder that we find ourselves getting stressed or frustrated. What I’ve discovered is that just understanding this concept helps me to keep from getting frustrated. I recognize that my story will probably change a lot from what I write in the morning, and that’s OK. I also recognize that I will have little control over what changes will be made. Other people will be contributing, without my permission, to my story, and I probably won’t agree with what they write, but it won’t frustrate me as much, because it won’t be a surprise. The best part about this “story” concept, however, is that I now understand that my actions also have the effect of adding a paragraph or two to the story of those I come in contact with. I will be a co-author in the stories of others. How cool! As a teacher, you re-write the stories of your students every day. That’s a big responsibility. How are the stories of your students different after they leave your class? How did you modify their story with what you said or did? Is their happy ending still intact after the time spent with you? When I think about this, I wonder how many times I changed the happy ending of my students when I was teaching. I wonder how many times I got frustrated and said or did something that wrote a detouring paragraph in the stories of my kids. Understanding this concept, I need to ask myself the question: How do my actions affect the stories of my colleagues, my family, my students now? Our story is not the only story. Most people naturally are focused only on their own story. We look out for ourselves and how our story is supposed to be written. Other people’s stories are not our primary focus, and that’s just the way it is. What I would like to encourage you to do is to consider for a moment the impact that we have in the stories of others. What kind of paragraph are we writing in the stories of those we come in contact with? Let’s, for a day, focus less on our story and more on the stories of our students, our colleagues, our family. Find ways to bring some extra joy into their stories. Look for opportunities to enhance and enrich the stories of our students and colleagues. Not all stories are written with a happy ending. You never know if a story that a student has written for himself is actually one with an unhappy ending. Perhaps that student in your class isn’t expecting a happy ending, since he’s used to a life full of unhappy endings. Whether you recognize it or not, you will be adding a paragraph into his story before he leaves your class. Understanding this, however, you now have the opportunity to write something that may lead him to experience a happy ending to his day for the first time in a while. Isn’t that cool? 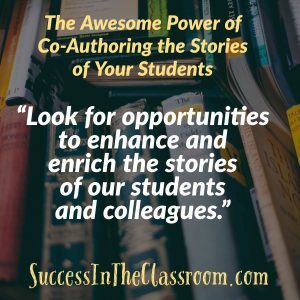 Whether we want to accept it or not, we are co-authors in the stories of people we come in contact with, and our own story is co-authored by a lot of those same people. Understanding this allows me to be less frustrated when my happy ending is re-written, but more importantly, it reminds me that as a co-author myself, I have the amazing opportunity to enhance the stories of those who I meet every day, and that makes me happy. Until next time, here’s to your Success In The Classroom!